Korea Aerospace Industries, the nation’s sole aircraft manufacturer, said Monday that it kicked off a self-reform committee, in an apparent attempt to recover from the multibillion won corruption scandal that led to the arrest of its former chief. The management innovation task force was one of the key pledges put forward by the organization’s new chief Kim Jo-won, who took office as president and chief executive on Thursday. Scheduled to be active until December, the team will be led by Kim Ho-joong, professor of business administration at Konkuk University. Members consist of six outside experts, including former Financial Supervisory Service Gov. 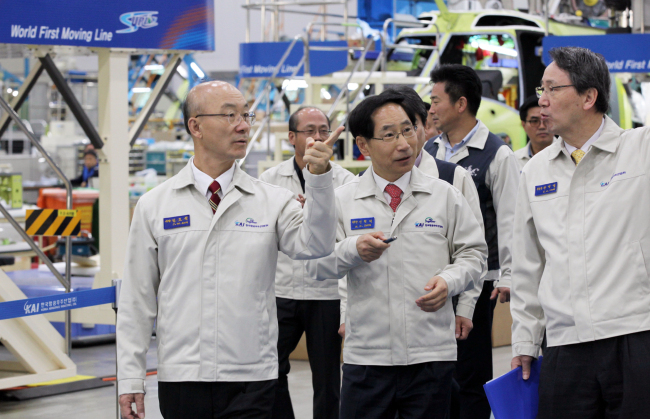 Kwon Hyouk-se and 13 senior KAI officials led by Cho Youn-ki, chief director for strategic planning. The goals are to figure out defects in KAI’s managerial system, diagnose current risk factors and devise short-term and long-term road maps to improve the company’s competitiveness, according to officials. The team consists of six outside experts, including former Financial Supervisory Service Gov. Kwon Hyouk-se and 13 senior KAI officials led by Cho Youn-ki, chief director for strategic planning. “We shall overhaul the managerial system in general, starting from scratch,” said the new KAI president. The aircraft manufacturer came under fire in July over a corruption scandal, involving several of its executives in a suspected accounting fraud and cost manipulating case over its multipurpose helicopter named Surion. Then-CEO Ha Sung-yong was indicted earlier this month on charges of garnering some 10 billion won ($8.9 million) in illicit profits by inflating prices of aircraft parts delivered to the Korean Air Force. KAI Vice President Kim Yin-sik died of apparent suicide in his home in September amid an escalating prosecutorial probe. While pressing for internal reform, new chief Kim also vowed to set the foundation for KAI to rise to 20 trillion won in annual sales by 2030. The company’s average annual sales over recent years has mostly been from 2.5 trillion won to 3 trillion won, with operating profits lingering around 200 billion won to 300 billion won. “KAI may be a corporation, but as a public organization, it should also actively abide by the government’s key policies,” Kim said during his inauguration speech, calling for an enhanced level of social responsibility from employees. Kim, who was until recently a plausible candidate for FSS chief, previously worked for 25 years at the Board of Audit and Inspection. He also served as senior presidential secretary for public discipline in the President Roh Moo-hyun administration in 2005.